Flexible dieting, #iifym, counting macros…If you follow fitness accounts on social media, then you may have seen these terms used in the captions of posts for #fitspo. The photos may include surprising foods like gummy bears and pizza. That is the selling point behind counting macros or macronutrients, a dieting strategy that allows you to eat all of the foods that you want as long as your food intake meets your personalized macronutrient ratios. Macronutrients are protein, fat and carbohydrates and you can easily use a variety of online calculators to determine personalized macronutrient ratios. These calculators account for basal metabolic rate, activity level and fitness goals like losing fat or building muscle. While the math can seem intimidating, the implementation of a macronutrient-based diet is extremely simple. Think about the foods you eat on a daily basis. Oatmeal made from oats, water and some fruit is basically carbs and protein. Add some nut butter or chia seeds and you have already incorporated healthy fats and even more protein into your breakfast as well. Protein, as all vegans and vegetarians know, is the macronutrient that bares the most scrutiny in a plant-based diet. For macro counters, protein is the most “important” nutrient and calculators typically set your protein macro at .8-1 gram for every pound of your bodyweight. For example, a 120-pound woman is allotted 96-120 grams of protein. Calculators then divide the rest of your daily calorie intake into carbs and fats. A typical ratio split based on a omnivore diet divides macronutrient ratios into 40:40:30 split, meaning 40% of your calories are from protein, 40% are from carbohydrates and 30% are from fat. On a vegan diet, macro goal can be extremely hard to accomplish without the assistance of protein powders, protein bars and other non-whole food sources of protein. For most plant-based eaters, carbohydrates are king among macronutrients and the majority of available plant-based proteins contain carbs as well, like beans, vegetables, and whole grains. The breakdown of your macro ratio and calorie goals also depends on your goals. The macros you follow will differ based on whether your goal is to lose body fat or to build muscle. There are many different approaches to eating vegan, just as there are many different macronutrient breakdowns you can follow to reach your goals. There is the somewhat controversial vegan diet of 80-10-10, in which you eat 80% of your calories from carbs, 10% from fat and 10% from protein. Having used macro counting to lose weight prior to going plant-based, I knew that it could help me to lean out again. However, I realized that it was not feasible to have the same macronutrient goals on a vegan diet. I also knew that I wanted to adopt a more intuitive way of eating that allowed me to eat in a way that felt good for my body. Full disclosure, I am not a fitness or nutrition professional, this is simply my personal experience. 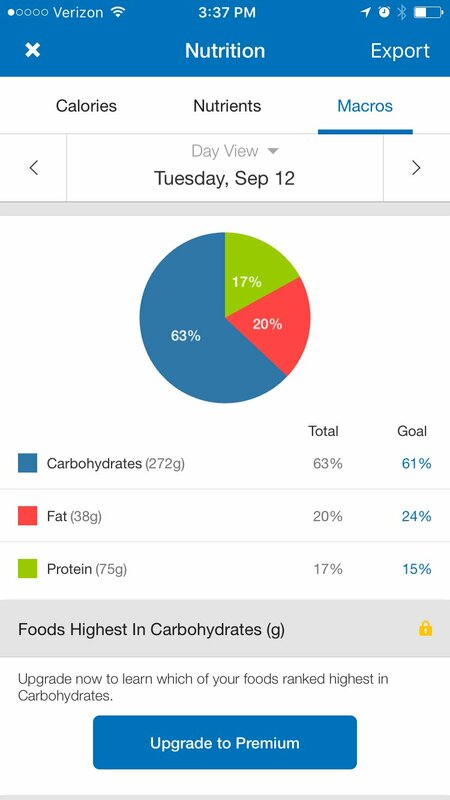 Before I decided on a new macronutrient breakdown, I tracked everything I ate for a week using the app MyFitnessPal to see if my diet naturally aligned with a particular macro ratio. Naturally, tracking your food intake makes you more conscientious of eating healthfully. But, I was surprised to find that everyday I ate about 65% carbs, 15% protein and 20% fat. On days where I ate significantly less fat or protein, I felt too hungry and ended up eating more than I needed. After a couple of weeks of eating along these lines, I definitely felt leaner and I never felt like I was bloated or overeating, which sometimes happened when I did not eat enough protein and ate too many carbs, a common occurrence when I first went vegan. I even ate my fair share of vegan junk food like pretzels and vegan cupcakes. Most importantly, I had lots of energy during my workouts and felt great. Ultimately, my experience with macro counting as a vegan is that it can definitely be an effective strategy to have flexibility with your diet and meet your goals. While entering your food into an app everyday for every meal can seem tedious, it actually becomes very habitual. Also, because I work full-time and I’m a busy wife and dog mom, I find it easier to plan meals ahead of time, so while planning, I simply entered all my food into my app at the beginning of the day to make sure I was within five grams of my macro goals. I love the way my body has felt while macro counting and I think it can be just as effective for vegans as it is for non-vegans. I not only feel like I am treating my body well and reaching my goals, but also like I am enjoying my life and that is a balance that just feels amazing. Have you tried macro counting? What kind of results did you see? Danielle Connor is a public health professional, dog lover and plant-based runner. She is passionate about volunteering with dog rescues, sustainable living and trail running. She documents her wellness journey on Instagram @Danielle.Lives.Well.